The Teen Economists: Vietnam over China? Where do most of your goods come from? If you asked anyone this question a typical response would probably be China. It feels like every time you look at a tag on a piece of clothing, shoe, toy, car part, or even furniture it will simply state “Made in China”, and in fact, the US spends about $29 Billion dollars on imports from China (1). Most big name companies will have at least some of their goods produced in China. Corporations such as AT&T, American Eagle, Coca-Cola, Dell, Gerber Foods, Hershey Foods, Honda Motor, Huggies, Ikea, and LG produce in China (2). The list goes on and on. The benefits of producing in China have been cheap labor on large scale orders, but recently another Asian nation has been attracting business away from China. With wages in China increasing 14% in 2012 (3), many companies have begun to look outside of China for means of producing their goods. Vietnam looks to be the next big producer in Asia. As Josh Feinkind, president of New York-based RefinedKind Pet Products said, “Vietnam will be the next China.” (4) Now, Vietnam looks to have a lot of upside in the Asian market of production. The rapidly expanding economy offers significant cost advantages as well as an eager workforce, and with Chinese wages rising Vietnam offers a work force who can produce at less of an expense. Currently, Vietnam is also offering numerous tax benefits to draw corporations into the company. For example, Samsung Electronics was granted four tax-free years and 12 half-price years for a $2 billion plant in northern Vietnam (5). Not only that, but Nike, one of the largest shoe manufacturers in the United States, had Vietnam produce 42% of their footwear compared to China’s 30%. More and more countries seem to be looking in the direction of Vietnam as foreign investments have dropped from nothing in Vietnam ten years ago to nearly $11 billion dollars annually invested in the Southeastern nation. Though with all this upside some corporations are still avoiding Vietnam. Why? Well Vietnam’s workforce is still young and inexperienced. They do not have the experience Chinese manufacturers have of producing large scale orders. The nation is also still adapting to the expectation of standards by companies. Also with a weaker educational system than that of China, Vietnam is lacking skill in their factories. Many company heads will also point to corruption and previous risk in Vietnam. A factory owned by the aforementioned Josh Feinkind was subject to this risk. He once lost a $20,000 deposit with a small factory that first failed to meet his quality standards, then ran out of cash to make replacements for him (6). Yet he still has faith in the country. A lower cost of production, more willingness to work with small companies, and a bright future is giving Vietnam a hopeful outlook in mass production, but at what cost? The opportunity cost of most of these corporations moving from China to Vietnam will not be too much, especially for multibillion dollar corporations. If a company could receive some tax benefits from Vietnam and was able to receive labor at a third of the cost of Chinese labor then the shipping would not be too much more expensive, considering both countries are on Asia’s eastern seaboard. Moving from Vietnam to China would cost some Chinese workers their jobs, but it also gives the Vietnamese more employment. Overall the cost of moving looks to be worth it if a company is simply willing to take the risk. 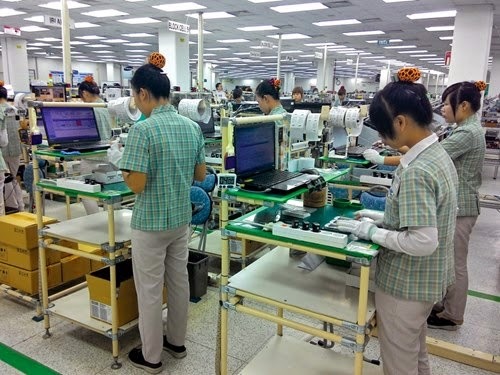 In five years, production in Vietnam could be equal to that of China. We'd love it if you'd share your thoughts and ideas. Don't forget to check back after commenting because we try to reply to all of your comments. Just remember to be nice, please! Minimum Wage Raise: Hurt or Help? © The Teen Economists, 2017. Do not reproduce articles without permission. Powered by Blogger.